The summer of 2008 I made a deep choice - to put my work on hold and travel to Canada for two months, accepting the invitation of two wonderful friends to stay in a yurt on their land in the mountains and write. The previous year I had taken a long sabbatical with the intention of writing, but unexpectedly I found I had to sort out many, many things in my life. I spent months ‘sorting’ so my writing only extended to two articles and some training documents. So the 2008 writing retreat was incredibly precious to me. During the final weeks before leaving for Canada I worked hard to clear my desk and put my business and my house in order, so others could care for them in my absence. The night before my flight I still had a huge amount to do. I persisted and persisted only lying down for twenty minutes all night. By 2pm on my day of departure, when the taxi came to take me to the airport bus, I was in a daze. How relieved I was to see the airport bus. Now I could relax. Nothing more could be done. I was on my way. The driver was unusually friendly and we joked as I got on. I sat three rows from the front, too tired to make my way further back. I had planned to sleep for the hour of the bus ride, but to my surprise I didn’t feel sleepy. I had not yet eaten lunch, so I began to eat my picnic. While munching I noticed that in the row in front of me, across the aisle, a man was reading a book. I could see the heading on the page, ‘The Gospel and the Zodiac’. This interested me. As a long-term student of astrology, any books on astrology are of interest to me. As one of the books I was writing was based on the Lord’s Prayer, I was thinking about Christianity and my unclear relationship to it. So seeing a book linking astrology and Christianity really attracted my attention. And seeing a man in his sixties reading this book also intrigued me. An unusual man, I guessed. I watched him as he turned the pages. He read some of the text, looked at the illustrations, read the back cover, and gazed at the front cover for some time. By squinting across I could just see the name of the author – Bill Darlison. I hadn’t heard of this author, even though I know many astrological writers, so I became even more intrigued. After a while he put the book down on the empty seat beside him, and I realised I was going to asked him about it. It was a different interior experience than deciding to ask him. It was more like the decision was made elsewhere, and I became aware of it with slight surprise. Oh! He passed the book over to me, and I looked at it with awe. It was a hardback - crisp, new, and barely opened. It had a beautiful, spiritual design on the dust jacket. I opened it randomly and the paragraphs I read struck me as deep, fresh thinking. The contents page looked interesting. I saw on the back inside cover that Bill Darlison, the author, sitting across from me, was the senior minister of the Unitarian Church in Dublin. I wondered what the Unitarian Church was. I looked at his photo and wondered about his choice of topic. In my experience Christian ministers do not usually feel comfortable with astrology. The bus driver announced we were nearing my airport terminal so I leaned over to hand the book back. Bill asked me if I was interested in astrology and we had a short chat about how we began our passions for this subject in rather similar ways, thirty years ago. He told me the book had just been published, this was the American edition, and he had just received it. Now I understood the especially tender way he had looked at each aspect of the book: the text, the illustrations, the back and front covers. I had been witnessing an author as he first looked at his completed and published work, after the long, long process of writing. I had witnessed this at the exact beginning - the ‘birth moment’ - of my own writing journey. This struck me deeply as a message about the circle – the cycle - of wholeness. From birth to completion. It felt so encouraging, and so startling at the same time. Who could have planned such an exact ‘beginning’ moment! I wondered what lay between this moment and the completion of my as yet unwritten book. The bus was arriving at my terminal. Bill commented, “Nothing happens by chance, not even on a bus,” and said he would like to give me the book. I was amazed. He asked me my name and in the front of the book wrote, “For Bridget - there are no accidental meetings! Bill Darlison.” I asked him to add the date – which he did: “24 June 2008”, commenting, “Oh it’s St John’s day”. St John the Baptist is ‘the one who comes before’ Jesus. His day is closely linked with the summer solstice, a turning point in the cycle of the year. I sensed layers of mystery beyond what I could grasp in that rushed moment. I hurriedly and gratefully received the book and got off the bus, stunned by this opening chapter of my writing journey. However I didn’t know where to put the book as my luggage was maximum weight and tightly packed. Then as I entered the airport I read that the carry-on luggage allowance had recently changed, and I could take two bags onto the plane (instead of just one, as I was expecting), so that problem was solved with as much ease as it had been created. I carefully put the book in one of my carry-on bags. About sixteen hours later I arrived in Seattle. My friend picked me up and after an evening meal I went to rest in her guest bedroom. I took out the book with some awe – because it was so lovely to look at, because of the sacredness of the topic, and because of how I had received it. I ran my hand over it and felt a small lump between the dust jacket and the hard cover of the book, near the centre. I removed the jacket to find out what is was, and saw – a grain of wheat. Wow. A grain of wheat! Somehow perfect in its wholeness. Under the jacket of the book. How did it get there? I thought about the picnic I'd been carrying – rice cakes, lettuce, goat’s cheese - no wheat products. I wondered whether I’d recently had anything in that bag which could have dropped off an entire grain of wheat. Perhaps a loaf of wholewheat bread? I didn’t think so. The wholewheat bread I sometimes bought did not have whole grains of wheat like this. It was fine milled without any surface texture at all. Also, I had shaken the bag out before I left home. Had the wheat appeared by itself, as a message of some kind? If it had been in the bag, tucked away in a corner, how had it gotten under the book’s dust jacket? And lodged itself so firmly there, right in the centre? Even if that could be explained, it felt very, very odd. As I fell asleep I wondered what the meaning of this grain of wheat might be. No convincing insight came to me, but I was sure I would find out. The next day I travelled to Santa Rosa in Northern California to join some friends at a Nonviolent Communication (NVC) Family Camp. The setting was an old ranch in the hills. About forty adults and forty children had gathered for a week of learning what it means to live together non-violently. I was joining them in the middle of the week as a guest. Soon after arriving I sat with my friends on the wooden verandah eating dinner. As we were finishing our meal, my friend struck up a conversation with a man at the next table. It emerged that he was a Catholic. They talked about various aspects of religion, Christianity, theology and NVC. I listened vaguely, partially interested, partially letting my mind wander, as I was tired from my travels and jet-lagged. He began talking about a group of theologians from around the world who had been convening to assess which writings in the Bible were really the words of Jesus. He mentioned that they voted on the passages using coloured beads. Coloured beads! Wow! Theologians voting with coloured beads! This woke me up. Colour means so much to me, and the oddness of these theologians marking their opinions in this way struck me strongly. Then he referred to a Unitarian theologian, so seizing the chance to understand more about the author of my mysterious book, I asked him to tell me about the Unitarian church. He explained that it is a very open-minded church, often praying without using the name of God or Jesus, and actively embracing and respecting all religions. I sat up, suddenly alert. Here, immediately after the dinner conversation about the Jesus Seminar, was another example of someone sifting through the Bible to extract the parts he considered authentic, and he described the process as ‘winnowing grain from chaff’. And I had found a grain under the book's jacket. My mind was spinning! How could these two very strange and recent coincidences combine in this one moment! Deeply curious now, I read on. On page 4 I discovered that Jefferson and others who before and after him undertook this attempt ‘to sort grain from chaff’ in the New Testament, took most of their material from the Gospels of Matthew and Luke. They avoided the Gospel of Mark, as its strange narrative style did not appeal to their rationalistic approach. Augustine (354-430CE) had a similar preference. The Jesus Seminar! My alertness increased even more! Only minutes ago I had heard about the Jesus Seminar for the first time, and made a particular effort to lodge the name in my mind. Now here I found it named on page 5 of this mysterious book. A book I’d been given the day before in unusual circumstances. The grain of wheat that appeared so mysteriously under the jacket of the book turned out to be the exact metaphor used by the author to describe, in one phrase, the radical message of his book! This book, that was intended to reveal “the purest wheat”, had somehow acquired an actual grain of wheat in the centre of its front cover! When I discovered the grain of wheat in Seattle the day before, I put it carefully on the table. I wanted to keep it, so when packing in a hurry the next morning I popped it into one of the small plastic zip-shut bags I had with me. When I arrived later that day at the NVC Family Camp in Santa Rosa I forgot about the wheat being in one of those bags, and I put things in and out of several of them as I settled into my room. Later, when I remembered and tried to find the wheat, I could not find it anywhere. So I decided to keep an eye out for it each time I opened one of those small bags. I was pretty sure I would come across it sooner or later. The wheat did not show up in Santa Rosa, nor (as I continued my pre-Canada visits) at my next stop in Oakland, nor during my stay in Santa Fe. I let go of expecting to find it, and decided it was not really important to have the actual grain of wheat. It had already made its impression. When I was getting ready to leave Santa Fe I packed, zipped up my suitcase, and sat back on my heels on the floor with a few minutes to spare. I gazed out the window at a vast view of the mountains of New Mexico. The view inspired me to contemplate my experiences since I had left home, and how I would be moving on now to Canada, where my writing retreat would begin. I experienced a momentary shift of consciousness, a deep state. Re-focusing after this silent, still moment I looked down, and there was the grain of wheat, directly in front of me, all on its own in the middle of the floor. It was the same colour and texture as the beige carpet. If it had not been right in front of me, I would not have seen it. Again I was confronted with this grain of wheat. I had first found it in such surprising circumstances, then lost it, and now found it again. Actually it seemed more like it had found me. Twice. As Groucho Marx said, “This can only mean one thing, and I don’t know what it is!”. But ‘The Gospel and the Zodiac' – the book that had so starkly brought the wheat grain to my attention – refers to the grain of wheat as representing the essential core of Jesus’s teaching. Was Life trying to get me to focus on Jesus’s real teaching, and to free myself from the roughage that surrounds it? To be sure not to lose the wheat again I found a more distinctive home for it, by emptying out a box of matches that was in the room. I have it in that matchbox still, many years later. The brand is Diamond. Recently I noticed that printed on the back of the box is this phrase: “Diamond – the Original Light!”. At the end of an amazing summer holiday Zak, age 11, decides to write his life story, because he wants people to understand his unusual experiences. He describes looking out from inside his mothers tummy, being born flying, learning to talk with animals, his inner not nowhere world, and the adventurous and mysterious summer he spends on River Island. There he encounters the wondrous zing that develops where nature is undisturbed by humans, and meets Leah, age 8, who to his surprise also talks with the animals, and becomes his best friend. 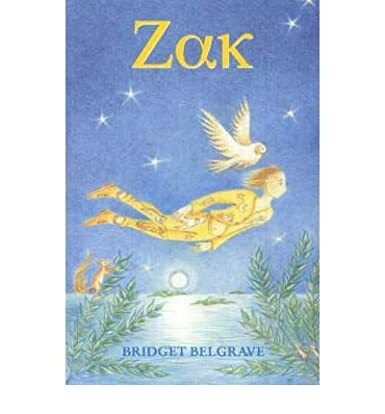 Loved by boys and girls, 7 to 12 years old, ZAK is a book which parents and teachers are delighted to discover. It addresses the roots of present day dilemmas -- how to preserve our climate and planet, and how human beings can create peace.